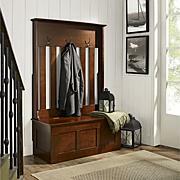 Wallis Entryway Storage Bench . Busy mornings and afternoons leave little time for corralling stray shoes and other belongings. 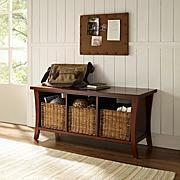 Make it easy for your family to leave everything right where they need it with this sleek storage bench. Three large cubbies with wicker baskets make it easy to customize your storage solution and hide the clutter of everyday life.